I'm sure some of you are wondering, what does a playdough craft have to do with clean living? Depends on how you look at it. First and foremost, I am a mother. It is the single most important job I will hold in my lifetime. I dedicate my days to making sure my son's days are the best they can be. Becoming a mother was the driving force behind my decision to live the cleanest, greenest way I possibly could. Our children will inherit this Earth from us one day, and it is up to us to nurture them, all of them, mind, body and soul. So while nutrition is my main concern and quite possibly the most important, so is feeding the brain, and that includes doing things like crafts, like making pumpkin pie playdough. I love making things with my son, and so they will be included in my posts from time to time. I figured I better post this craft now seeing as the fall season is winding down. I love crafts that involve cooking something and then getting to play with your creation. I strive to have my son in the kitchen cooking with me at least once a week, so this week instead of cooking something to eat, we made playdough. My son loves Play-doh, but he especially enjoyed playing with this since he had a part in making it. Anytime you get your kids involved in the creation process, they appreciate the end result so much more. The great thing about making your own playdough, besides spending quality time with your kids, is it's incredibly easy to make, and most of us have the ingredients on hand in the pantry. 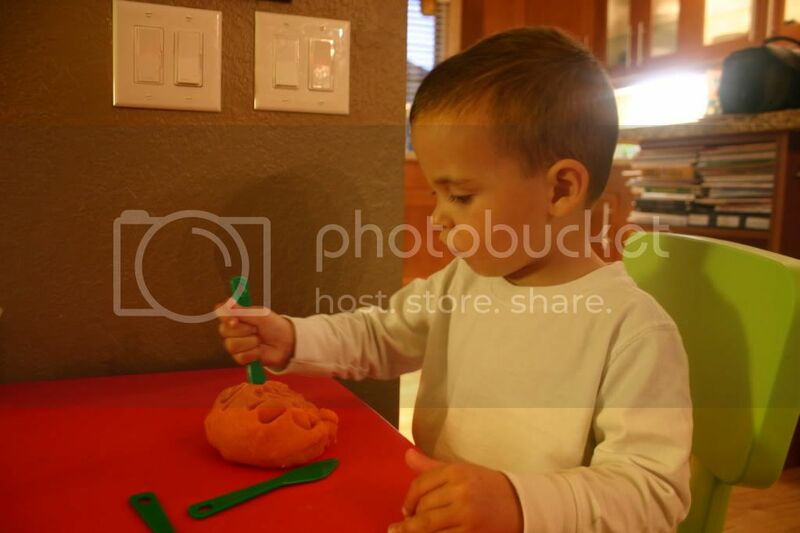 It was wonderful to see his little face light up as I told him our project today was making pumpkin pie playdough. 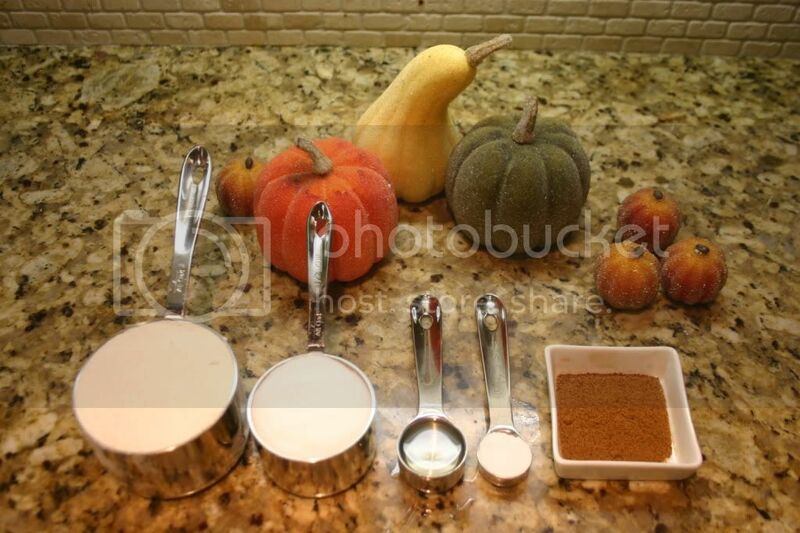 "Pumpkin playdough? That's silly mommy". He immediately ran into the kitchen, pulled up his little stool, and grabbed his spoon. Pouring and mixing are two things that toddlers have mastered, and this project lets them do both! He poured in the flour, salt, and water, and almost managed to get the oil in the bowl. I let him give the mixture a few stirs before putting it on the stove. He could hardly wait long enough for it to finish cooking. "Now can I play with my playdough", he kept asking, over and over. Thankfully this recipe comes together in no time, and he was off squishing and shaping before I even had time to wash the pot. He was already talking about how he couldn't wait for daddy to come home from work so he could show off his masterpiece. I know he may not remember making this with me, but I will never forget these moments. To witness the sheer joy and enthusiasm he exudes just warms me to the core. It was impossible not to hear the pride in his voice as he told me, "I'm your big, good helper mama". You sure are baby, you sure are. Pour all ingredients into saucepan and cook over low heat. Stir frequently. Dough is ready when it rolls into a ball, about 5 minutes. Keep dough fresh in an airtight container. Although I am a huge advocate against the use of dyes, as you can see from my picture, I did use food coloring in my recipe. I figured since we wouldn't be ingesting it, ( hopefully), and since we didn't plan on rubbing it on our skin, (wait, I am talking about a two year old boy) , I saw no harm in adding a little color to his dough. 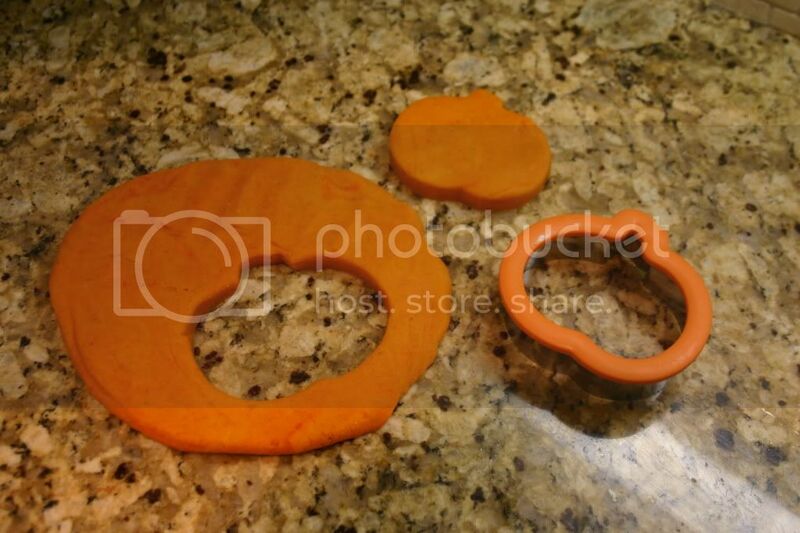 Besides, he seemed to prefer orange playdough over the "funny" flesh color it was when we pulled it out of the pan. I didn't have any orange food color on hand, but I did have yellow and red, which presented another great teaching moment about what happens when you mix certain colors together. Sounds like so much fun!! Jocelyn and I are definitely going to make this!! Hi Jenn, I hope you and Jocelyn love making this together! This has become the only play dough Jayden wants to play with, I suppose because he made it himself!